Active since 2014, the core mandate of the United Nations Multidimensional Integrated Stabilization Mission in the Central African Republic (MINUSCA) is to protect civilians, promote and defend human rights, and assure the delivery of humanitarian assistance. More than 200 UN Volunteers currently serve in the country, making it one the largest deployments of civilian volunteers in UN Missions around the world. The presence of the UN Mission since 2014 has helped save many lives and greatly improved conditions for the delivery of vital humanitarian assistance in the Central African Republic (CAR), a country where approximately 40% of the population is dependent on humanitarian assistance to survive, according to OCHA. With nearly 2 million people in need of relief, and ongoing threats of violence, the challenges for the more than 200 UN Volunteers serving in MINUSCA are great. UNV’s role in supporting the Mission is to ensure that it benefits from the recruitment of the most qualified and motivated individuals who are ready to serve as UN Volunteers—people who are determined to deliver results even under the most challenging circumstances. Through their dedicated service, they must contribute to the delivery of the Mission’s mandate, including the improvement of conditions for its population. Faced with ongoing security risks due to the presence of armed groups, UN Volunteers offer hope for peace and reconciliation by travelling to communities across the country. Once on location, UN Volunteers serve as mediators to initiate and support local dialogues that it is hoped reduce the chances of recurring cycles of intercommunal violence between Muslim and Christian communities. The rapid deployment of UN Volunteers in 2014 allowed the Mission to open Field Offices and to have the necessary personnel to start the implementation of its core mandate, despite remote living conditions and security challenges in Bangui, the capital, and in the provinces. One of the biggest successes of UN Volunteers in the country was their support to the peaceful organization of a constitutional referendum followed by legislative and presidential elections held between December 2015 and March 2016. UN Volunteers, like Madina Dia (Senegal) who served in the Bambari Field Office, worked with local election authorities to develop strategies that promoted a fair and peaceful process. Their approach included organising advocacy and trainings sessions for local communities and armed groups. The successful completion of the democratic process marked an important milestone for CAR, and a return to constitutional order after three years of crisis. Volunteering for peace and development through the UNV programme is one of the most rewarding and life-changing experiences. In Paoua, the presence and actions of UN Volunteers significantly contribute to bringing healing, joy and hope to the communities they serve. UN Volunteers use their personal experiences, sometimes from conflict-affected areas, to inspire and empower the local population, in particular youth, and to encourage them to reject violence and to get actively involved in peace and development initiatives. Beyond their assignments with MINUSCA, UN Volunteers contribute to building trust and confidence in the work and presence of the UN in the country. Many UN Volunteers in the field today are involved in community activities, such as providing free language courses, facilitating reading clubs, and supporting local schools. 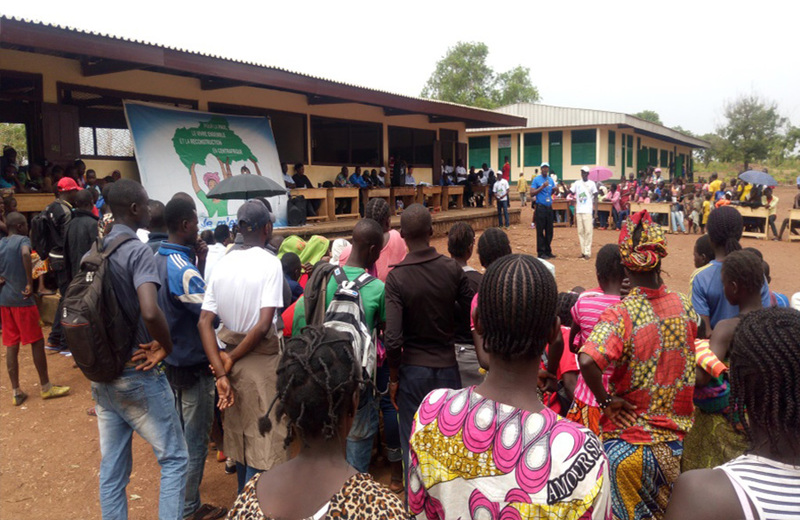 For example, a group of UN Volunteers in Paoua provided textbooks to the high-school and put together an advocacy campaign to support the construction of a library, going far beyond the core duties of their assignments. UN Volunteers enrich the diversity and the impact of the Mission.